In May 2017, at 23 years old, I was diagnosed with stage 4 Non-Hodgkin Lymphoma. Earlier in the year, I had noticed a bump on my groin that I figured would go away with time. Instead, the lump just got bigger and bigger. I finally decided to have it looked at four months later. After numerous tests and visits to my gynecologist (due to mass location), I was told nothing was wrong. I knew that although it was the answer I wanted to hear, it wasn’t the correct one. I finally made an appointment with a gynecologist-oncologist, where I was told I needed surgery to remove the mass in order to test it. A few days after surgery, it was confirmed that I had lymphoma. The subtype was diffuse large B-cell and Follicular Lymphoma, which meant I had a fast and slow growing cancer. Treatments started a few weeks later and lasted a total of four months. I was blessed that everything went as well as my doctor imagined. I have been in remission as of December 4, 2017. I am blessed to have loving friends, family, and co-workers that got me through this time. I look forward to putting this behind me and moving forward with my life. My biggest piece of advice is to not dwell on the diagnosis and feel like it’s the end. Stay positive and try your very best to continue life as normal. My second piece of advice is to find an oncologist you truly feel has your best interest at heart. I couldn’t have done it without mine! 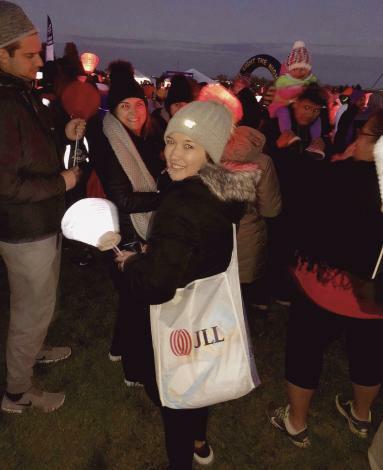 This was my first time being a part of the Light The Night Walk, to support The Leukemia & Lymphoma Society. After support from loved ones, a beautiful ceremony, and walk, I decided to make this a yearly tradition!